In this tutorial, we’ll walk you through how to create your own YouTube-like app. The final application will allow users to upload and share videos to the public. We will use React for the client side, Node.js for the server side, and Filestack to upload and transcode the videos. Although we’re highlighting YouTube-like apps, this tutorial will be helpful if you are building any type of application in which users upload and share videos, whether that be a social network, an educational platform, or anything else! Please note, this tutorial will use Filestack’s V3 File Picker. If you are still using V2 for any reason, please use this tutorial instead. Simple to integrate in your codebase, just link to the js file or add the package through npm (from version 3). 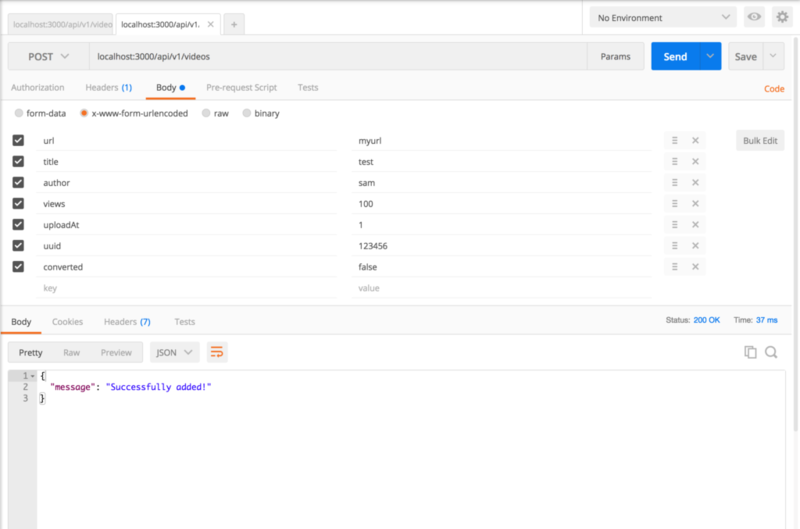 The uploader function pick receives an options object where you can define a set of constraints such as file type, maximum file size, the source to upload files from etc. Filestack returns a CDN link of the file which improves the overall performance of your apps. You don’t need to focus on the security so you’ll spend no time thinking about how to protect your backend from malicious files uploading as Filestack does it for you. Through the Filestack process API you have access to loads of image transformations like filters, cropping, face detection and even audio and video transcoding. In this specific tutorial we will provide users a file uploader and the video transcoding, two features that usually would require a lot of development time which becomes a matter of minutes with Filestack. A basic knowledge of the two ecosystems. But don’t be afraid! The codebase is pretty easy to follow along. Finally, we deployed the app on Heroku for you to try, you can find it here. "start": "NODE_ENV=production webpack && node server.js"
– Notice nodemon, this is an exception as we are going to actively use it to run our server in development mode (watch-dev command) and it automatically restart the server whenever a change to the backend codebase is applied. – The dependencies section is what we are going to rely on to write backend and client. The server packages are express, body-parser, cors and morgan while the client ones are react, react-dom and react-router. Throughout the tutorial we will see them in action. Plus, filestack-js, the new picker V3 API. to create the node_modules folder and install all the packages inside. 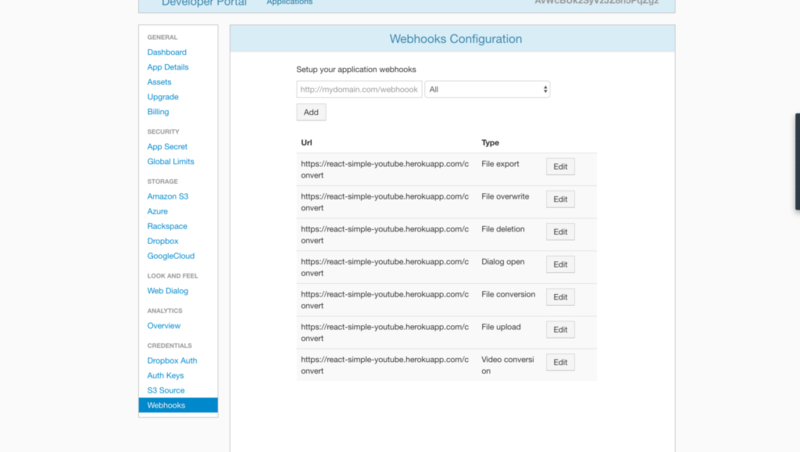 For simplicity we added the URL and chose all so all the webhooks points to the youtube app on Heroku. NB: We are using a free API key so we have a limited amount of monthly conversion, more than enough for the current tutorial but for a commercial app it is definitely not enough. We are finally ready to play with the server. 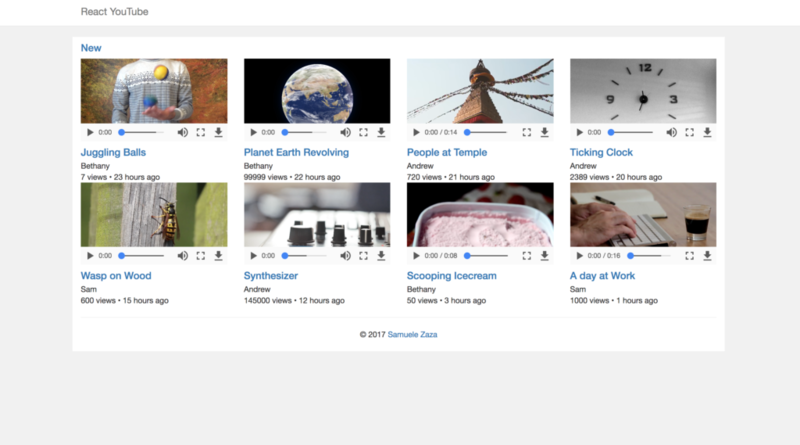 GET /api/v1/videos: Get all the videos. POST /api/v1/videos: Save a new video in the DB. 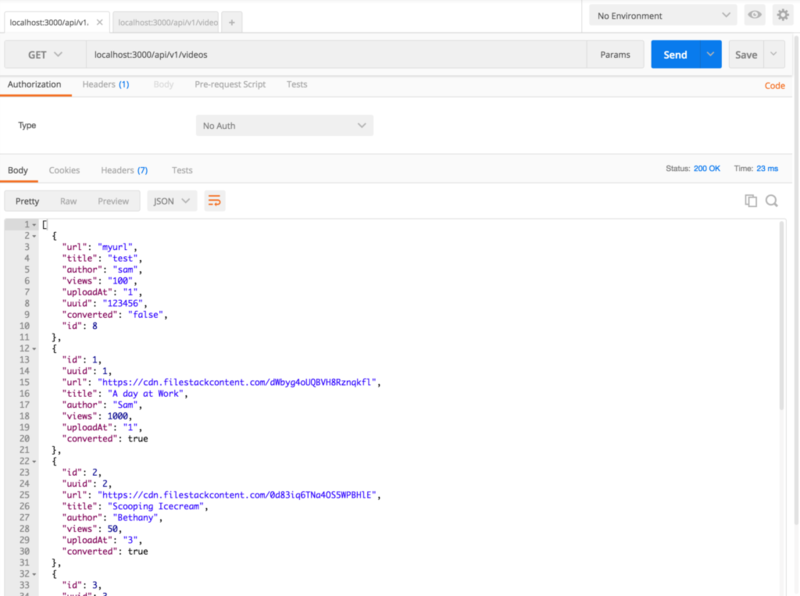 POST /convert: Webhook for Filestack to send the new URL. GET /convert: Shows the latest response object from Filestack. Throughout the process Filestack sends responses to update the server regarding the process by POST requests to /convert. We are saving the response and return in with GET requests to /convert. 1. Before saving the video to Database we make a GET request to the Filestack process API with the video handler to request the transcoding. 2. Filestack returns the uuid we are going to save along with the video information sent by the user. 3. We get back the uuid again after the transcoding completion, so we use it search in the DB for the completed video, then update the URL and show it to the users in the homepage! Trust us, it’s easier to write the code than explain it! We required all the server related packages on the top of the file as well as created the express server. Then, we read from /api/db.json a set of default videos an create the in-memory db, just an array of videos after all! Thanks to body-parser the server is gonna parse the body of the requests to get the video information. Also, the server accepts application/json types. In development mode the express server is gonna serve the API to webpack-dev-server so we enabled CORS. morgan logger is used to show useful info in the terminal whenever a request is received. We have the videos API with GET and POST routes to /api/v1/videos to send the videos or to create a new and store it in the DB. Finally, /convert routes are in charge of handling Filestack responses. Notice the POST route, we get the status and when equal to completed the video with the same uuid gets updated and finally allowed to show up in the client. We created 8 videos to populate our client and their converted property is set to true. Moreover, views and uploadAt are nothing more than random integers between [1, 100000] and [1, 23] (hours) respectively. 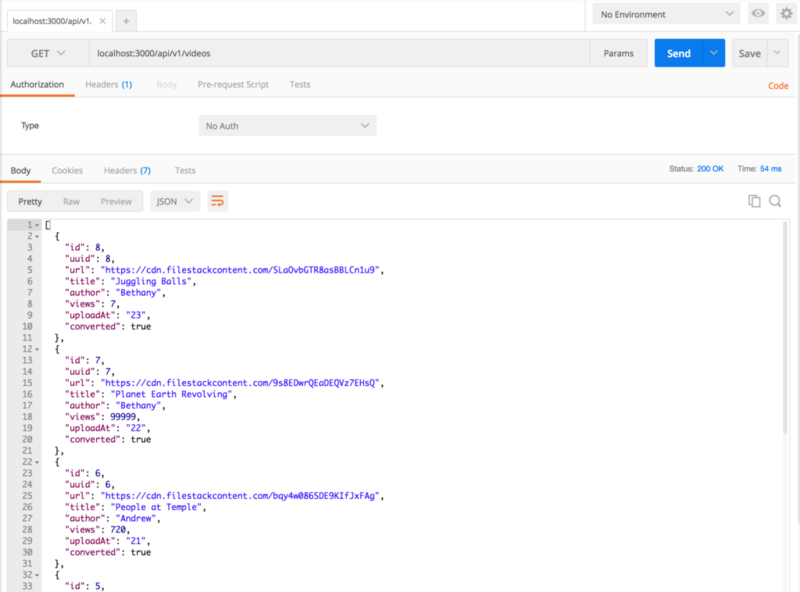 and try to make some requests with Postman. Notice we receive all the videos in the DB. We tried to send fake video information to the server and apparently the video was created and stored. Awesome, it shows as first one! Don’t forget we revert the DB order so that the latest video is always at the top of the list. The remaining routes of /convert are not for read and write the DB but just to accept Filestack responses. Let’s now write the client! Both shares the navigation bar so we can have a Layout component which renders the navigation bar and the two children. The two children are going to be containers, we can call them Home and Add respectively. We defined our Router that renders the Layout component at path / which includes /add too. In fact, for / we render Layout along with Home container as it is the component prop of the IndexRoute. This is just a stateless functional component that renders Nav and the children as expected. Again, this is just a navigation bar created with bootstrap and self-explanatory. We are going to update this file throughout the remaining part of the tutorial in order to export all the created components. It’s now time to work on the two containers `Home` and `Add`. The Home component is in charge to fetch the videos from the server and show them in homepage of our app. VideosList is the component in charge on the videosList array to map each video to Video component. Morever, it shows the new link to change view to /add. Footer is a simple component which renders the company name at the bottom of the page. That’s a typical container where we set the state in the constructor and populate videosList through fetch in componentDidMount. Notice that the URL comes from /src/config.js as we are going to use it in Add container as well. In fact config.js exports all the constants we need throughout the app, the URL of the endpoint as well as Filestack API key. __DEV__ is a global variable we defined with a plugin in webpack because while in development we serve the client from webpack-dev-server, in production on Heroku we instead serve the client directly from Node.js. Obviously the URL endpoint is going to be slightly different. NB: Don’t forget to substitute YOUR_API_KEY with the real key you received from Filestack. videos array is a prop received by its parent Home. Before mapping the video object to the Video component the videos are filtered because we want to show in the homepage videos that were previously converted by Filestack. This explains why once the user uploads a video it will not immediately show in the homepage but instead it will take some time, precisely the time Filestack API needs to transcode it. This is another stateless function component that shows the video and its information to the users. Notice that I used the video HTML5 element which shows the video inside a player. In case the Browser does not support the element it will unfortunately show the string your browser does not support the video tag. Feel free to write your own information inside the footer! it’s now time to move to the last container, Add! This is where users can upload their favorite videos. When they click on submit we first ask for transcoding and then save the video information along with the uuid returned by Filestack. 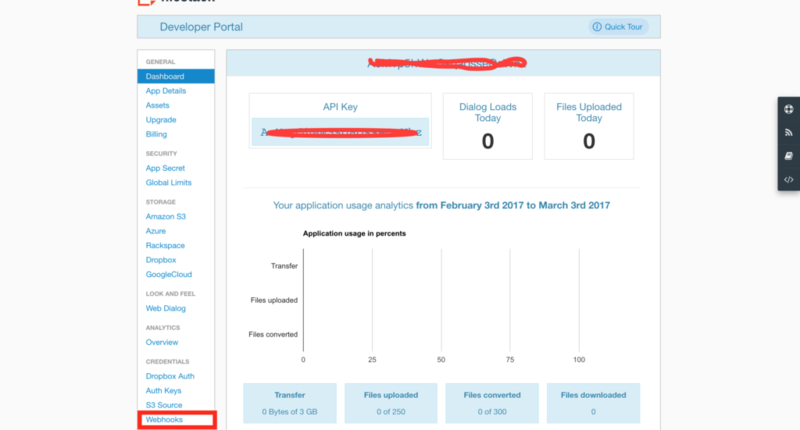 Filestack provides the so-called process API to apply different enhancements on the uploaded files. The difference is just that with the first method there is no need to send the API key as it only processes files uploaded on Filestack, while the second method can process any file given the URL. AhTgLagciQByzXpFGRI0Az is the API key (you would want to use your own). video_convert is the conversion task with a few options for the size (height, width) and the format (preset). Q5eBTKldRfCSuEjUYuAz is the Filestack Handle, this is returned whenever a file is uploaded as part of the CDN URL. For instance, https://cdn.filestackcontent.com/Q5eBTKldRfCSuEjUYuAz. We are going to use the same structure in our app and once we receive the response the video is sent to the server to be stored. In the constructor we set the URL to empty string. handleClick calls filestack function to communicate with its API and then set the URL in the state. The uploader shows up as a model where only videos are allowed to be uploaded (mimetype property). handleSubmit is the core function of the view. The curl variable is the process API string we discussed before. We convert the video with preset:webm and aspect_mode:preserve to keep the original size of the video and formatted to webm. In addition to this, we concatenate the handle which is latest part of the URL in the state. Finally, the render function which shows the form to the user, the components are all uncontrolled so that we can use a ref to get form values from the DOM. Once the video is uploaded a preview will be shown. Now open the browser to https://localhost:8080 and the homepage should show up! However, we suggest you to deploy it to really see Filestack transcoding in action. In this tutorial, we created a YouTube-like app where users can upload and share their favorite videos. The process consists of uploading and transcoding the video using the Filestack API. Moreover we have seen the new Filestack V3 in action. We leveraged its ability to apply transformation to the uploaded files to transcode videos. 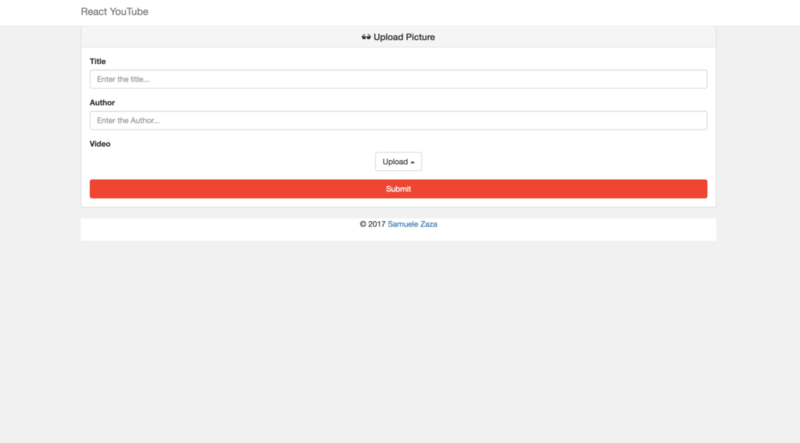 Lastly, we integrated the uploader and customized it to limit the upload to videos only. I hope this tutorial went well for you! If you haven’t yet – sign up for a free Filestack account today to start taking control of your end user content with ease.